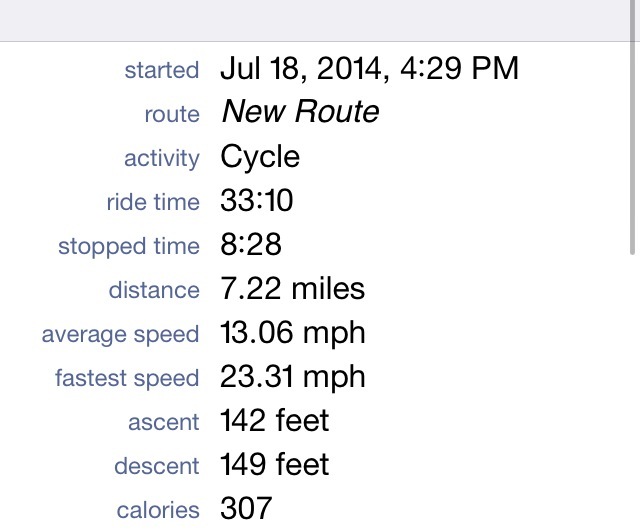 I burned 296 calories on the way home. When I got home Michael and I got ready for our new mattress to be delivered (more on that later) and then jumped on the bed with excitement! Saturday morning Michael and I went over to Dove Lewis Hospital for a two hour Pet First Aid class. I had been looking forward to this class for months! We tried signing up back in March but it was full. Bella is such an active (crazy) dog and she hurts herself a lot (and we’ve hurt her accidentally), so I knew it would be beneficial to take a class like this. The class was really thorough and the instructor was funny and made the two hours fly by. She had anecdotal stories and used some “dummy” dogs as examples. 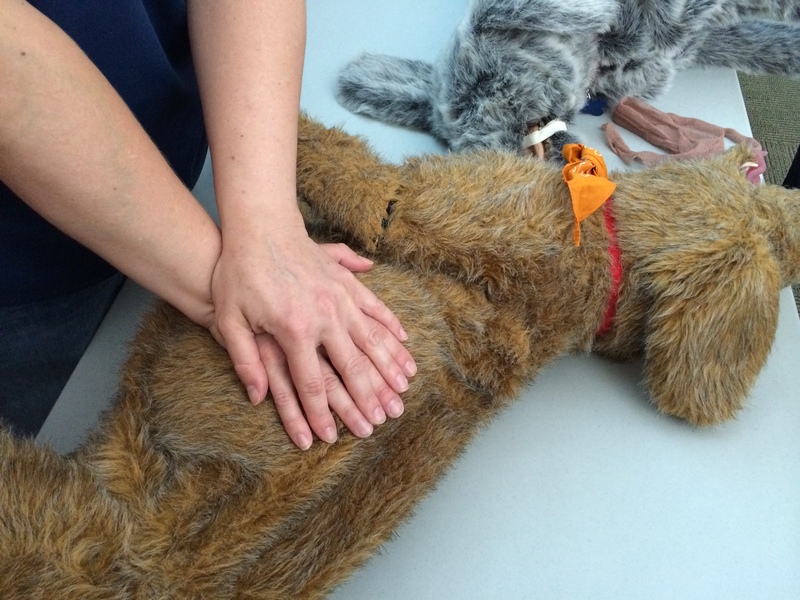 We learned how to perform CPR on dogs and cats and even got to practice on the fake dogs. It was a lot harder than you think it is. The heimlich maneuver is the same principle as with humans, except with cats you turn them upside down. Doing CPR on a dog is very similar to humans. Put them on their side, though, and the compression rate is the same as humans. She suggested to do it to the beat of Staying Alive by the BeeGees. I wanted to share some of the tips and information we learned in the class. One of the big tips was to use KY Lubricant on open wounds. For example, if Bella is out and about and gets a gash or open wound, clean it with water to get the dirt and stuff out of the wound, then put KY on it and wrap it with a bandage. This is for a few reasons–first, using something Neosporin traps germs and dirt in the wound. Second, the tissues needs to stay moist in order for the vets to sew it back together. Good tip! Phoebe was super cute and a really good dog. And she was clearly used to being man-handled in classes! So if you put your hand underneath the dog’s leg, kind of like the “armpit” or elbow, you can feel a pulse. A normal heart rate for dogs is 80-140 beats per minute, for cats it’s 140-200 beats per minute. 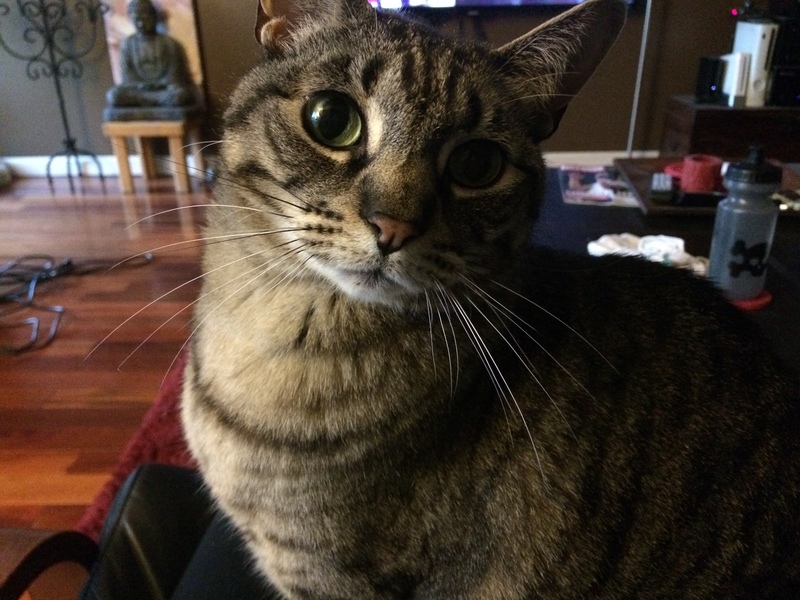 If the pulse is really slow in cats, that’s a bad thing. When they are in distress their heart rates and temperatures tend to decrease instead of increase. If the dog has been injured badly and needs to be picked up, or has injured their head/face in any way, you want to muzzle them to prevent further injury–especially to yourself. The vet said that even if it’s YOUR DOG, that doesn’t mean it won’t bite you if it’s freaked out. 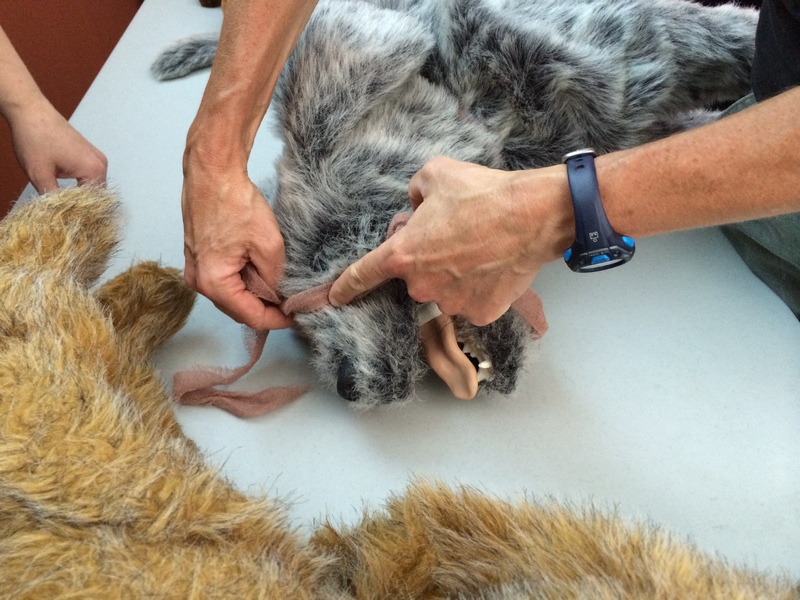 She showed us how to create a muzzle with a scarf (or belt or leash). You wrap it around their snouts (not too tight, they still need to breathe and swallow) then wrap it around the back of their ears and tie it off. Giving mouth to mouth is the same as humans, too. You cover their nose and mouth, letting the tongue hang out a little bit and then breathe. If the dog is still breathing but they seem weird, check their gum color. If it’s grey/blue/white/purple, get to a vet hospital right away. If it’s pink they are doing ok and the heart is working properly. If the gums are bright red they might be suffering from heat stroke. Heat Stroke! Something I have worried about with Bella. She said that some tips for heat stroke is to cool the dog down with room temperature water–just get them all wet. Put them in front of a fan to cool off. If they are panting really hard, check for saliva. If they are drooling and it’s a normal amount/color/consistency, they are probably ok. If there is no saliva or it’s a weird color or thickness, they are dehydrated and need to go to the vet hospital right away. She said don’t use ice water to cool down the dog because it causes the blood vessels to constrict and is counter-intuitive to how dogs cool down. The class was definitely more dog focused, but it did cover some good cat stuff and there was some hands-on experience as well as discussion. 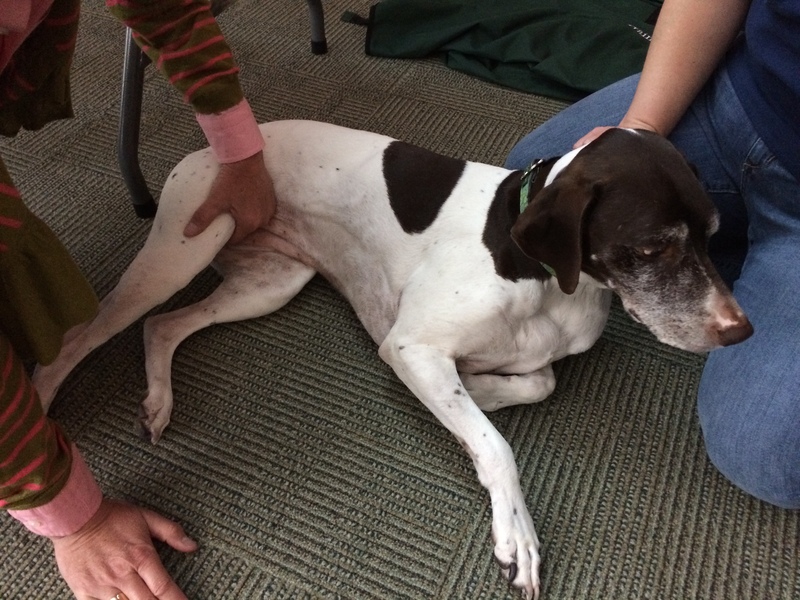 The vet answered a lot of questions that people had and everyone had some good questions. I asked her about some of the stuff we’ve wondered about Bella and she reassured us about things. I asked about the mushrooms that sometimes pop up in our yard. I do my best to check the yard a few times a week and pull out any that I see but you just never know. She said the ones that grow in our yards here in Portland SHOULDN’T be poisonous, that Bella might just get diarrhea for a day or so. But there ARE some super poisonous mushrooms, especially out in the wilderness, and she suggested you don’t let the dog off leash in the springtime while hiking just in case she finds something. 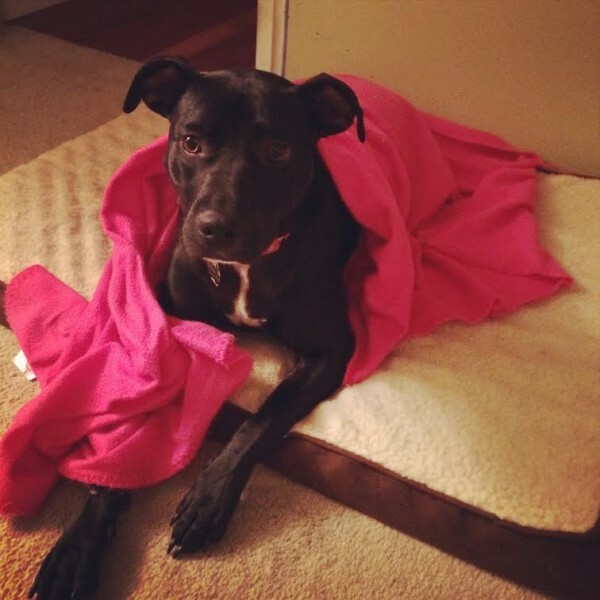 Some signs of poison–diarrhea, vomiting, neurological issues (like stumbling, not being able to walk, her dog had been poisoned once and was licking the walls–so just look for abnormal behavior) and seizures. Those are obviously medical emergencies and the pet should go to the hospital. It was a great class!! I am so glad we went and I would recommend it to anyone here in Portland. It was by donation (and donations are great because the hospital is open 24/7). If you live elsewhere, definitely find a pet first aid class near you. It was so helpful and I think it taught us a few tricks that we didn’t know before and gave us some insight on what to look for. After the class Michael and I went downtown and grabbed lunch on our way home. 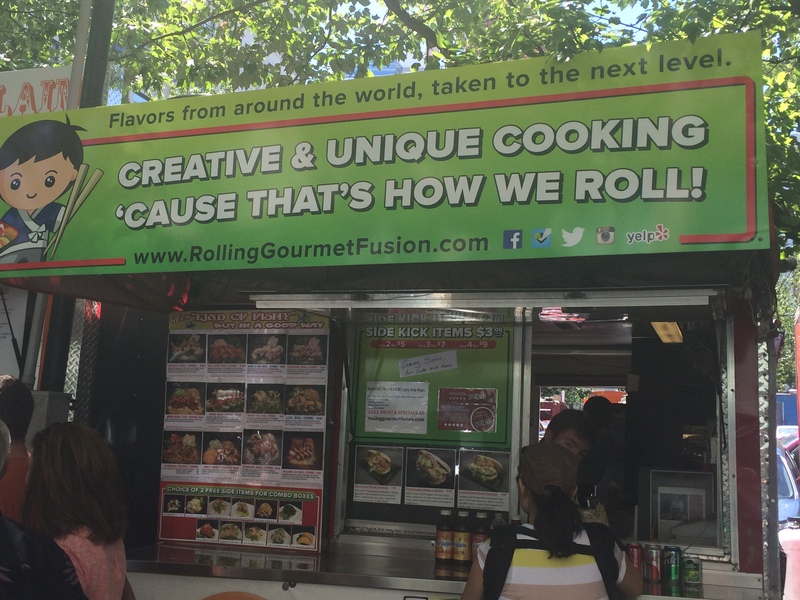 We stopped at a sushi cart, The Rolling Gourmet. 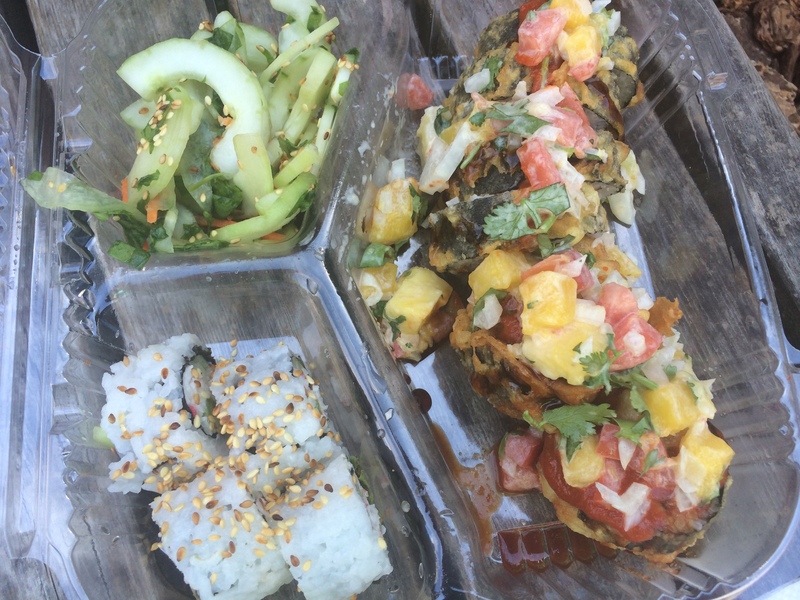 I know, I know, sushi from a food cart? It sounds terrifying but it was really good. Michael has been raving about this food cart for awhile now. The rolls are really big, so you only need to order one specialty roll. 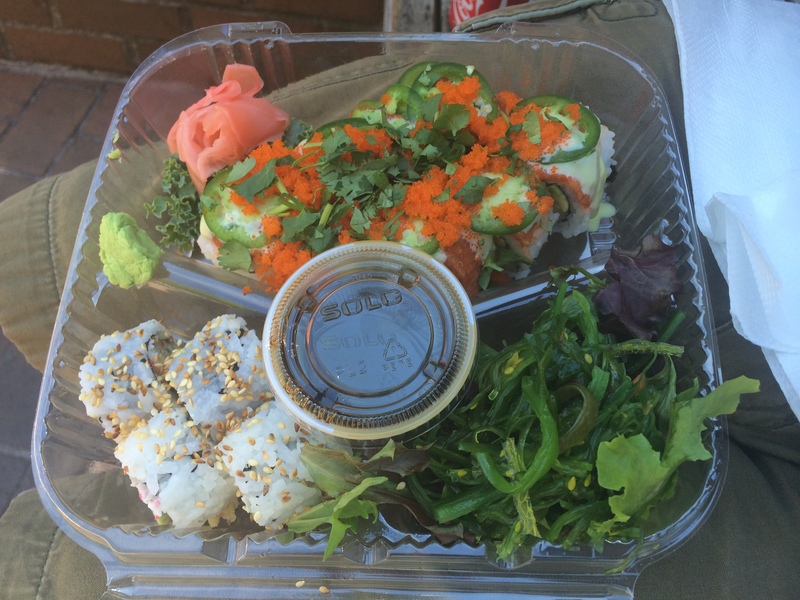 They come with two sides–I got a california roll and a cucumber salad. The specialty rolls rotate every day so it’s something different each time. 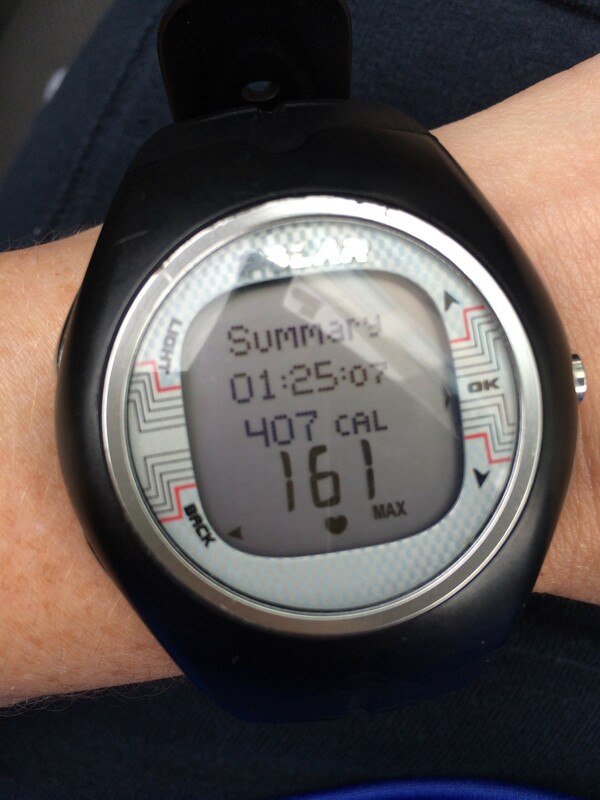 My Sunday started with a warm-up on the elliptical and then yoga class. 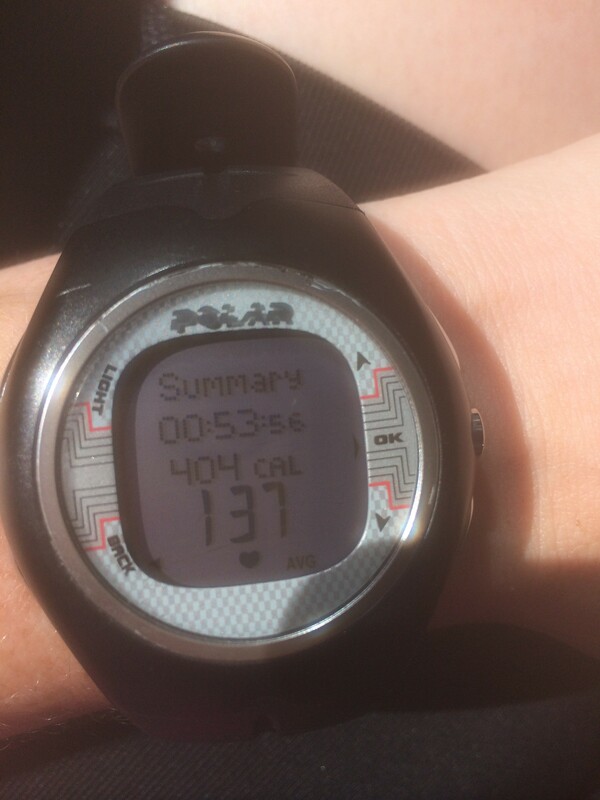 I really needed that yoga class. I’d been feeling tight in all the wrong places. Um, what are they?? Pictures posted to Facebook. 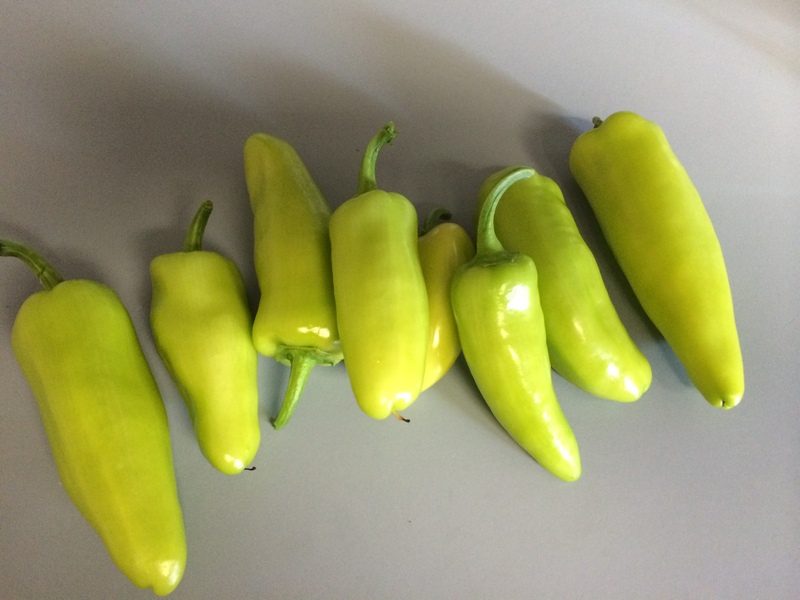 Some people said anaheim peppers, I thought banana peppers, someone else said poblano, someone else said Hungarian yellow waxing peppers. Still no idea. The plant looks EXACTLY like the other jalapeno plants. Just with neon yellow peppers on them. I ended up slicing up some of the larger mysterious peppers and put them in a jar with salt and vinegar. 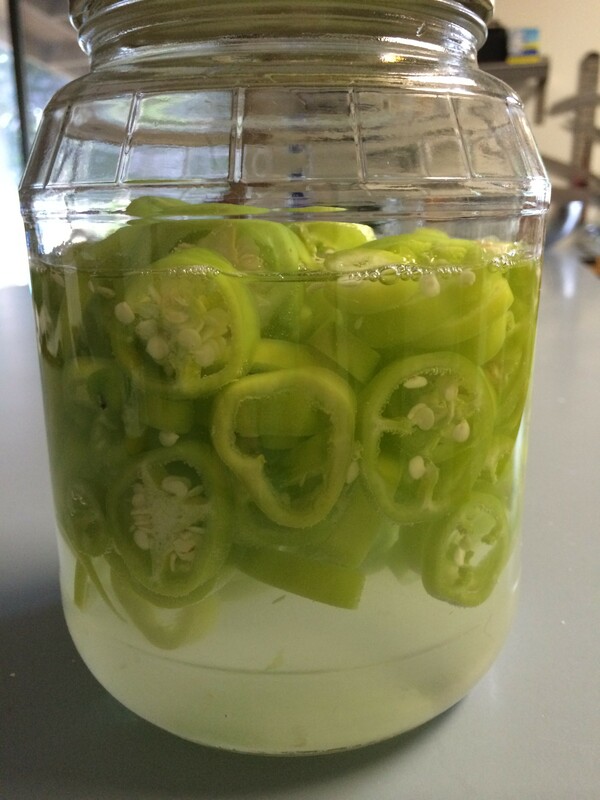 This is something Michael does every year with our jalapenos and we have delicious pickled jalapenos all winter long. I decided to do the same with these peppers and time will tell what they taste like…Oh and that tip they say to use latex gloves when chopping peppers? Yeah. Ooops. Didn’t know about that until after I cut these babies…lesson learned! That is so interesting. Never knew that this was even available. I’m going to try and get into the class too! I hope you do go to the class. It was really interesting and it’s free (donation). 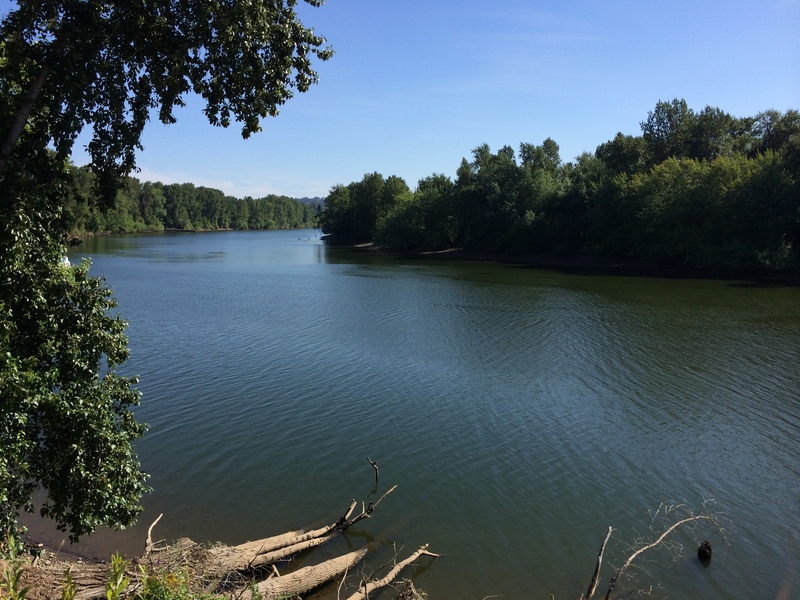 It’s such a good service to the community, I can’t recommend it enough for Portlanders. Let me know when you take this class! Nice. Sounds like a fun weekend.